I have noticed a large variety of “impedance” ratings for speakers; such as four ohms, eight ohms, 16 ohms, and others. Why so many? Is it just to make the design of the power amplifier easier by matching the output impedance? Well, that’s part of the answer — but it’s not the whole story. Let’s begin with the physical construction of a loudspeaker, as shown here. Basically, a loudspeaker consists of a voice coil (electromagnet) suspended in a magnetic field. When a current is run through the coil, it creates a magnetic field that forces the coil inside or outside the magnetic field — according to the strength of the current and its polarity. The stronger the electromagnetic field, the farther the displacement (throw) of the voice coil with respect to the permanent magnet. If an AC voltage is applied across the voice coil, it will move in and out as the field changes polarity. 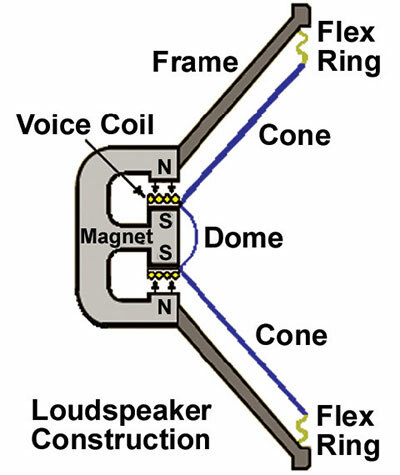 The voice coil is glued to a paper or plastic cone that moves in step with the voice coil. This movement translates the electron flow into air movement — a.k.a., sound. Early on in the development of audio amplifiers, many methods were used to produce this movement. The most feasible was and is the voice-coil loudspeaker described above. The critical element of this design is the voice coil itself. It is nothing more than many turns of copper wire — wire that has resistance that’s measured by the foot. For example, a typical eight-ohm, four-layer woofer voice coil contains about 120 feet of number 28 solid copper wire. That’s a lot of wire to shove into the small gap between the north and south poles of the permanent magnet. Consequently, it’s physically more practical to use a smaller wire with more resistance than it is to use larger wire, which is harder to work with when forming a rigid voice coil destined for a small space. But here comes a trade-off. Current times voltage makes watts. So voice coils with more resistance require more voltage to produce the same wattage. In the days of vacuum tubes, this wasn’t a problem. They required hundred of volts on the plate and an output transformer in their design, so loudspeakers of that era were typically 16 to 32 ohms because the value best fit the tube to transformer coupling — and the materials and manufacturing methods of the time. With the advent of semiconductors, voltages decreased and currents increased. That coupled with the discovery of rare-earth permanent magnets with stronger magnetic fields (versus Alnico) made it realistic to use lower resistance coils. For example, the car stereo market uses almost nothing but four-ohm speakers due to voltage limitations available in cars (specifically 12 volts). More power can be driven into a four-ohm speaker than an eight-ohm speaker (assuming the same driving signal). Are four-ohm speakers better than eight-ohm speakers? Absolutely not! The ohm rating of a speaker has nothing to do with the quality of the speaker. But it has a lot to do with the way you wire an array of speakers together. Is an eight-ohm speaker really eight ohms? Not likely. Due to the highly complicated nature of a loudspeaker, its impedance is not a simple number, but an AC reactive value that changes with frequency and loading that can vary between six and 20 ohms. But that’s a story for another day. For now, when a speaker is said to be four or eight ohms, this is understood to be its nominal impedance.